Sanbeiji (simplified Chinese: 三杯鸡; traditional Chinese: 三杯雞; pinyin: sānbēijī; Pe̍h-ōe-jī: sam-poe-ke; literally: "three-cup chicken") is a popular chicken dish in Chinese cuisine. The dish originates from the Jiangxi province of southern China, is a specialty of Ningdu, and has become especially popular in Taiwan. There are several versions for the origins of sanbeiji. These stories often involve a cook who placed three cups of sauces into an earthenware pot and simmered it for a long time. One version is that of Wen Tianxiang, a national hero and Jiangxi native during the Song Dynasty. Wen was captured by the invading Yuan armies of Kublai Khan and tortured for 4-years during his imprisonment. It was during this time that a sympathetic prison warden cooked the dish for him (using these limited resources) before Wen Tianxiang's execution. The dish derives its name from the three cups of sauces required. For each chicken, a cup each of soy sauce, rice wine (usually mijiu although it may be mixed with Shaoxing jiu), and sesame oil are added. 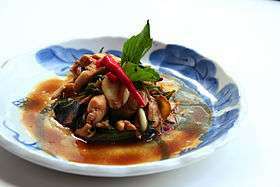 Lin Shangquan, a famous chef in Taiwan, believes that the traditional recipe called for a cup each of soy sauce, sesame oil, and sugar, with added ginger, garlic, and basil. The chicken, together with the sauces, is cooked in an earthenware pot on high heat for ten minutes, then on low heat to allow the sauces to be absorbed by the meat. Sanbeiji is served with no sauce; the dish is cooked until all the sauce evaporates and is absorbed by the chicken. When it is served at the table, the chicken should be sizzling—even popping—on the cusp of burning. This gives the chicken a crisper texture (and richer flavor) unlike most other Chinese or Taiwanese stewed dishes. The dish is then eaten with either steamed rice or rice congee. Other meats, such as pork or frog, can be substituted for chicken in this dish without detracting from the taste.